Free ground shipping on orders over $100. Exclusions apply. Please see individual product descriptions for details. Offers are valid in the 48 contiguous U.S. states only. Shipping method of our choice. If a specific method is needed, please contact us at 816-779-4677 or 866-863-2349. Being Centrally located, our packages typically reach the majority of our customers in 1 to 3 Business days! Note: If you select First Class Mail for small light orders, the USPS does not offer tracking capabilities for first class mail, therefore First Class Mail is sent at customers own risk. Our Volusion shopping cart conveniently calculates a shipping quote upon entry of only your postal code and State, so that you can easily compare shipping methods and pricing for your chosen items. Orders received Monday- Friday before 3:00 pm CST typically ship that same day. Orders received Monday-Friday after 3:00 pm CST ship the next business day. Orders placed on a weekend or shipping holiday will ship the next business day, unless additional information is required. Shipping estimates begin the day after your order is shipped and also exclude weekends and shipping holidays (e.g. a 2-Day Air order shipped on Thursday will be delivered the following Monday). 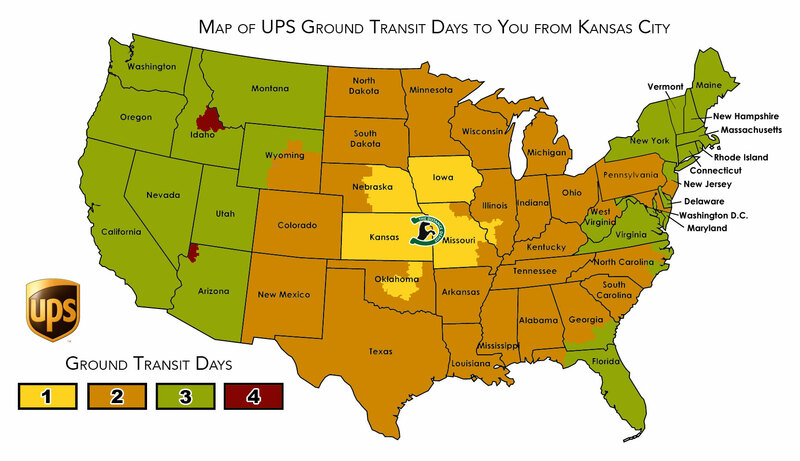 48 Contiguous U.S. State Customers - Our UPS Ground shipping charge is based on the weight and size of the package. Next Day Air and 2nd Day Air delivery charges depend on the weight and size of the box and final destination. We can also ship orders via U.S. Postal Service. We accept returns up to 365 days after date of purchase. Any item returned for a refund must be in 'like new' condition and within 30 days of receipt. If in "new" condition and more than 30 days from receipt date, store credit will be issued. If our returns department cannot sell the item as new, we will contact you and make arrangements for partial store credit. Should you need to exchange an item, you may call us for an RMA# and do the exchange at that time. Or, you can return the item along with your RMA# and we can make the exchange for you at that time. Valid on return orders shipping within the 48 contiguous U.S. States only *Note: Orders outside of the contiguous US are responsible for shipping charges on returned product. If The Distance Depot (within its discretion) does accept any item that has been used, or is missing tags, and out of its original packaging, there will be a 15% restocking fee. When shipping a return to us, you are strongly advised to insure your shipment and obtain a tracking number. The Distance Depot cannot provide a refund or exchange if your package is not received. PLEASE BE SURE TO NOTE YOUR TRACKING NUMBER. Ariat guarantees all of its products to be free of defects in materials and workmanship. We firmly stand behind everything we produce. This, however, is not a guarantee against normal wear and tear. Nor does it apply to product that has been damaged by misuse, accident, modification or unauthorized repair. If you believe you have purchased a defective Ariat product from The Distance Depot, please contact The Distance Depot directly. You must provide proof of purchase. When you purchase an Ariat product, they offer online warranty registration. Click here to register your product. Ariat guarantees all of its products to be free of defects in materials and workmanship. All apparel must be returned in NEW condition (unwashed and unworn) with original tags still attached. Apparel that has signs of washing or extended wear (beyond trying on) cannot be returned or exchanged. Please make sure the apparel item does not have any fuzz/lint, human or pet hair, dirt, or any other foreign substances before returning them. Bits must be returned with all original tags/packaging attached Bits must be returned in brand new condition in order to receive a full refund. Full refunds will not be given for bits returned in less-than-new condition. Partial or full store credit may be issued at the discretion of the The Distance Depot's Returns Department. Boots and shoes must be returned in NEW condition. Please return boots or shoes in the same manufacturer boot/shoe box in which they arrived. If appropriate, please use the shipping box the boots or shoes were shipped in to return boots or shoes. Do not place any shipping labels or tape directly on the manufacturer boot or shoe box. Please make sure the boots or shoes do not have any sock fuzz/lint, human or pet hair, dirt, or any other foreign substances before returning them. Please send the boots or shoes with a note stating if you would like credit or an exchange. Returns do not pertain to Beta Biothane & Nylon tack as all Beta Biothane & Nylon orders are considered custom made and are NON RETURNABLE. All BioThane & Nylon orders are custom and are based on the accuracy of your measurements and are therefore not returnable. If you have a problem with the fit, we will gladly make any adjustments at no charge for the first alteration only. The customer is responsible for all shipping charges including the return shipment back to customer when the alteration is complete. If The Distance Depot (within its discretion) does accept the return of any custom Beta Biothane or Nylon tack item, there will be a 15% restocking fee. Additional shipping and handling charges to exchange your items will be applied to all exchanges. We offer a 1-year warranty on the BioThane items against any defect on the workmanship in the construction of the item. EasyCare, Inc offers a 30-Day Money-Back Guarantee and a 90-Day Warranty. Visit their website, www.easycareinc.com for tips and product information that will help with the use of any of our product line. 24 Kerrits Guarantee Kerrits unconditionally guarantees all of its products for 1 year from the date of purchase. If for any reason you are not satisfied with your Kerrits purchase, return it with the original receipt to The Distance Depot and we will exchange it or issue you a refund. Kerrits believes the sale is complete only when you are completely satisfied. High Country Plastics guarantees their water caddies for 3 years. If your High Country Plastics product develops a defect or becomes unusable within this warranty period, please submit a photo of your damaged item to info@thedistancedepot.com along with the information associated with your original order. These photos will be forwarded to High Country Plastics for evaluation. If the manufacturer does conclude that the product qualifies for warranty replacement, a replacement item will be shipped to you directly from the manufacturer. If any "brand new" "unused" item is returned, you will incur a 15% re-stocking fee. If the item has been deemed "used" (obvious use of the item) you will incur a 30% re-stocking fee. Should you exchange the item for another - no restocking fee will be incurred. Note: Any returned items that do not abide by the guidelines above will either be sent back to the customer or will be issued a The Distance Depot store credit, minus an applicable restocking fee, at our discretion. All Returns and Exchanges must be submitted within 365 days of the invoice date. Returns and exchanges received after 365 days will be sent back to the customer and a refund or credit will not be given. Limitation of Liability - In no event shall the seller, The Distance Depot, Inc. be liable for special, incidental or consequential damages or for damages in the nature of penalties. Seller is a distributor of products manufactured and warranted by others. The goods sold are furnished as is by the seller and are subject to the manufacturers warranty. Seller makes no warranty, express or implied, of fitness for a particular purpose. Horses are strong and unpredictable creatures; it is therefore the responsibility of the owner to assess fitness and suitability of a product for his own horse. The Distance Depot, Inc. acknowledges that the word BioThane is a registered trademark of Bio Plastics, Inc. and we simply use their products to make custom horse tack.